Some folks seem to attract trouble while some attract good fortune. Some get a little bit of both. 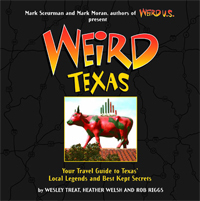 Roy, a friend of my dad’s in the 70’s, was once driving from San Antonio to West Texas along US Highway 90 when he had a unique introduction to a 100 year old mystery that local believers and skeptical researchers have never adequately explained: the Marfa Lights. Outside the city of Marfa, about 80 miles northwest of Big Bend National Park, there is a scrub brush desert that lays claim to an enigmatic phenomenon known as the Marfa Lights. These lights appear as glowing orbs, floating a few feet above the ground, which zoom quickly and erratically across the desert, and have sometimes been attributed to atmospheric reflections of distant car lights. This might make sense, except that they’ve been seen for well over 100 years. According to a state historical marker and local legends, the mysterious lights date back to as early as 1883. Visitors who stop along Highway 90 in the fall have a decent chance of seeing these lights at dusk as they zip across the desert for many miles. While my mother claimed to have seen them in her younger days, she saw them like most others, from a high point looking out over the desert around Marfa. But one eyewitness, a coworker of my father’s, got a bit closer than most. In the late 1970’s, when I was a teenager, my dad spoke to Roy who made occasional trips out to West Texas from San Antonio. He told of a trip in which he encountered these lights. And mysterious though they may be, they also appear to play games. Roy said he had been driving his small pickup truck for about 8 hours and had out-driven the coverage of most AM radio stations long ago. He entertained himself by singing along with the 8-track tapes he kept in his glove box. Having left San Antonio mid-morning, it was now well after sunset but not yet fully dark. It would only be minutes before the stars overhead were so numerous that defining constellations would be all but impossible. 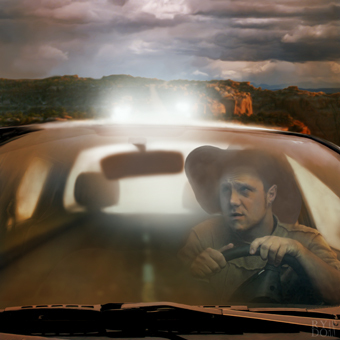 It had been quite a while since he’d seen another car on the road, and he took notice when a pair of lights appeared in his rear view mirror. He glanced down at his speedometer to make sure he wasn’t speeding and relaxed when he saw he was doing less than 5 MPH over the limit. That wouldn’t even pique the interest of the most jaded county sheriff, since most folks out that way drive at a good clip to close the gap between the vast distances of the region. My dad said that Roy had been driving with the lights a comfortable distance behind him for several minutes when the vehicle sped and up and approached his truck rapidly. For a few seconds, he honestly thought he was about to be rear-ended. Before an impact occurred, however, the lights stopped a few feet short of hitting his truck. At 60 MPH, in the middle of an otherwise deserted highway, it probably wasn’t too much to ask for the courtesy of a little breathing room. So Roy tapped the brakes. The driver of the vehicle behind him maintained his distance. Roy again tapped his brakes––no response. Finally, very annoyed, Roy jammed hard on his brakes for a fraction of a second. To his amazement, the vehicle behind him stayed the exact distance from his rear bumper as it had been. Roy decided to try a different approach. He said he floored the gas pedal making his small truck shudder and lurch ahead. The speed crept up to 80 MPH. The lights behind him reacted in perfect unison, staying several feet behind his truck, as it approached speeds Roy was sure he’d never pushed it to before. At nearly 100 MPH, the truck was beginning to vibrate badly, but the lights did not waiver. Enough was enough. Roy eased off the gas and let the truck coast down to a sane speed, and then he stood on the brakes. The tires screeched and smoked, and the truck pitched and slid slightly to the side––but the whole time, Roy watched the lights in the mirror. They stayed in exactly the same spot until the truck came to a stop. Roy then saw something completely unexpected––the lights shot out, off the road to the right, and fired across the desert like missiles. He craned his neck around to try and follow them visually, impressed by the driver’s driving on what was sure to be very rough road. He smiled and was about to drive on when a thought occurred to him. He frowned, and, making sure that he wasn’t about to be run over by a big rig or other traffic, put his truck in reverse and slowly backed up maybe a couple of hundred feet. He checked the barbed wire fence line for a road, a gate, or other break of some kind where his pursuer might have slipped through––but there was none.